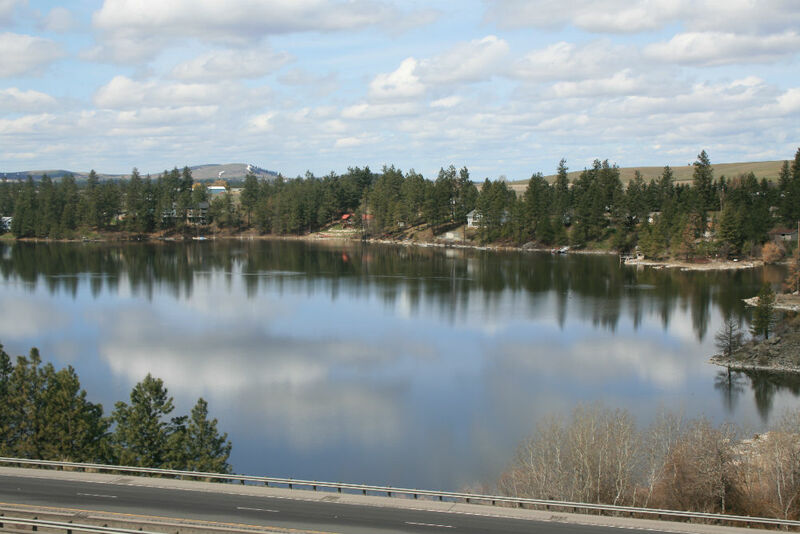 Granite (22 acres) and Willow Lakes (29 acres) are two nice lakes that are great for general boating or sailing due to the strong winds that regularly blow over them. The lakes run 2-15' deep and are nice for small non daggerboard dinghies and kayaks. Combustion motors are not allowed on these lakes. There is a private Island on the East end of Granite lake next to W. Medical Lake Four Lakes Rd causeway. There is a causeway (W. Medical Lake Four Lakes Rd.) that separates Granite Lake from Willow lake, which SHOULD be your access point to both of these lakes (there are no developed boat launches on these lakes). You can access Willow lake from this causeway but as for Granite Lake there is an old barbwire fence with no trespassing signs along the causeway that blocks one's entrance into Granite Lake. Actually this fence is not legal due to the fact that the county owns the causeway and also no one owns navigate-able waters (however out of not wanting to cause an issue do not portage over this fence). If you can get to the shore of a lake legally then you can access it unless otherwise posted by the City, County, or Federal Government, no non-governmental landowners can post restrictions signage on public lands. County and Federal lands are owned by taxpayers and thus can be accessed by the public, again unless otherwise posted by the City, County, or Federal Government. I90 runs along the South shore of Granite lake and thus is owned by the public (there are no restrictions signs along this area) and there is a guard rail that curves out to get you off the Interstate paved shoulder, so this is your access point to Granite Lake. The bank is steep to the Lake so caution should be exercised and is best suited for portaging a kayak down, so for the general public dinghies cannot be launched into this lake. Please respect private lands at all times and Do Not Trespass EVER! If in doubt regarding accessing a lake via land that is unmarked contact the county the lake and land is located in to get correct access info. The lakes are located just west of Spokane on I-90. 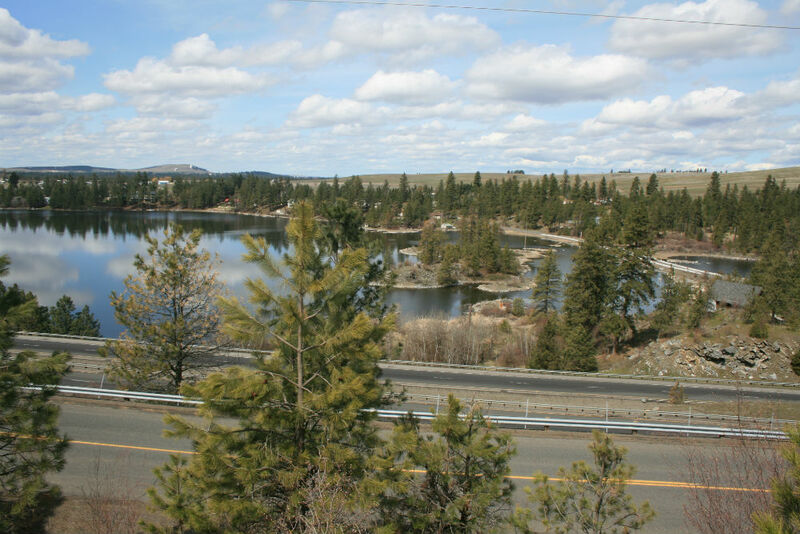 Spokane County has purchased a tract of land along Willow Lake to develop a water access park. Right now via the causeway one can only hand launch a small dinghy or kayak. Granite and Willow Lakes are both great for boating such as kayaking or sailing, however particularly in late summer and fall the water is very low and makes it hard for any type of boat with a rudder or daggerboards, etc. to navigate without hitting the bottom. The lakes also at this time are soup like with algae and in Willow Lake there is a lot of iron in the water. Launching in mid to late summer is also difficult because you have to walk in the mud to launch. Directions: From Spokane Take exit 270 (going east take exit 395), right (west) on W. Medical Lake Four Lakes Rd., Left on W. Silver Lake Rd. Maps: See printable Granite Lake map below. To view a map click on google.com/maps and type in Granite Lake, Spokane County, WA. This picture does not show the off Interstate parking area. There is a spot where the guardrail bends towards the lake creating a wide area where one can park legally. You must park absolutely all the way off of Interstate road pavement. We recommend you put a note on your vehicle windshield indicating you are kayaking on the lake so if the highway patrol stops to check your vehicle they will know why its park here. Remember when accessing this lake via the very steep bank to wear hiking boots and attach a long line to the guardrail that will reach the water. It would be easy to let go of the kayak by accident and let it slide into the lake, and then might float out of reach. Note there is a place to launch of the road causeway between the two lakes, but is likely posted still with no Trespassing. ACCESSIBILITY: Not accessible other than via a very steep bank. ACCESSIBILITY: PARKING... Gravel parking along roadway. Make sure to be completely off roadway as to not impede traffic. PATHS/TRAILS... None; RESTROOMS/FACILITIES… None; SENSORY... No sensory tactile markers for those with visual and other impairments. DOCKS/LAUNCHES/PLATFORMS… None. 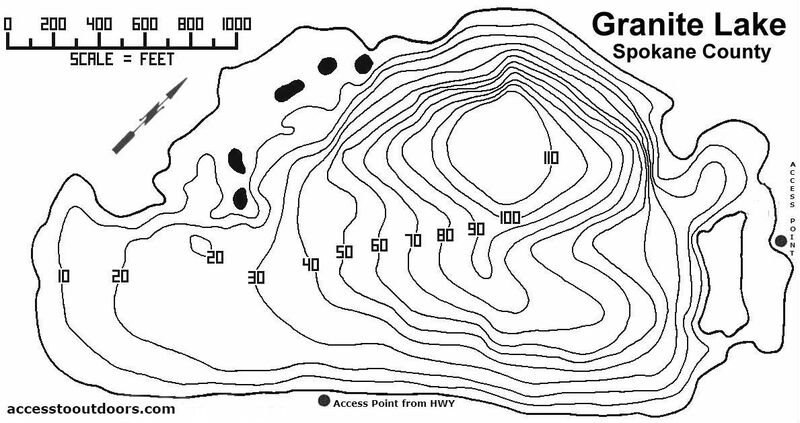 Launch off bank; DIRECT WATER ACCESS… No access for wheeled mobility devices; TRANSFER SYSTEMS... None; CAMPING... No; O.T.H.E.R… Oddities/Barriers: Nothing unusual; Terrain: Level to about 3%; H2O/Water: Water extremely murky. Not a lake we recommend for swimming. Water temperature in the summer can be around 60 to 70 degree; Environmental Conditions: High winds and hot temperatures in the summer; Resources: Food, drinks, and gas in town of Four Lakes.